Impact / scratch / heat and moisture resistant 10mm solid grade laminate doors. Keeping your personal belongings organised and secure is easy with these Trespa Solid Laminate Door Lockers. These laminate door lockers have a welded construction which provides high security, and includes the welding of compartment divisions within the locker itself. For improved security, recessed door sills make prising open nearly impossible, and yet these units are built to last at a very reasonable cost. The Trespa laminate door is secured with five knuckle hinges. The hinges provide 270 degree opening along with maximum resistance to damage. 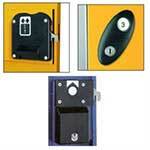 Micro sprung disc locks are included with each door, and two keys are supplied for each lock. Additional security measures can be customised, however, for each set of lockers purchased, such as hasp & staple locks, a digital lock and cover, a coin/token return lock or the standard camlock. 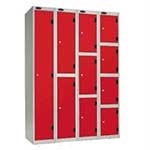 These Trespa solid laminate door lockers are available as single tier, two tier, three tier and four tier. For those with space constraints, a low two-tier locker is also available in the same model and with the same optional accessories. 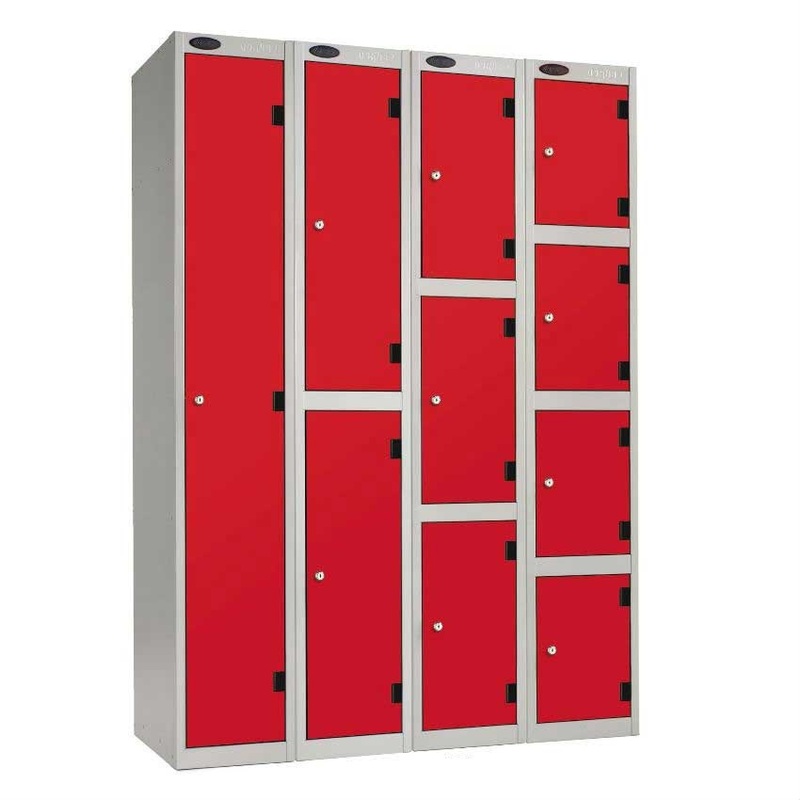 The lockers are available in four door colours as standard: Red, Blue, Oak & Speckled White. The carcass colour is grey as standard, however a black carcass is also available at extra cost, or custom door colours can be ordered, subject to minimum quantity requirements. All door colours hide the dirt and fingerprints very well, yet clean up quite easily. 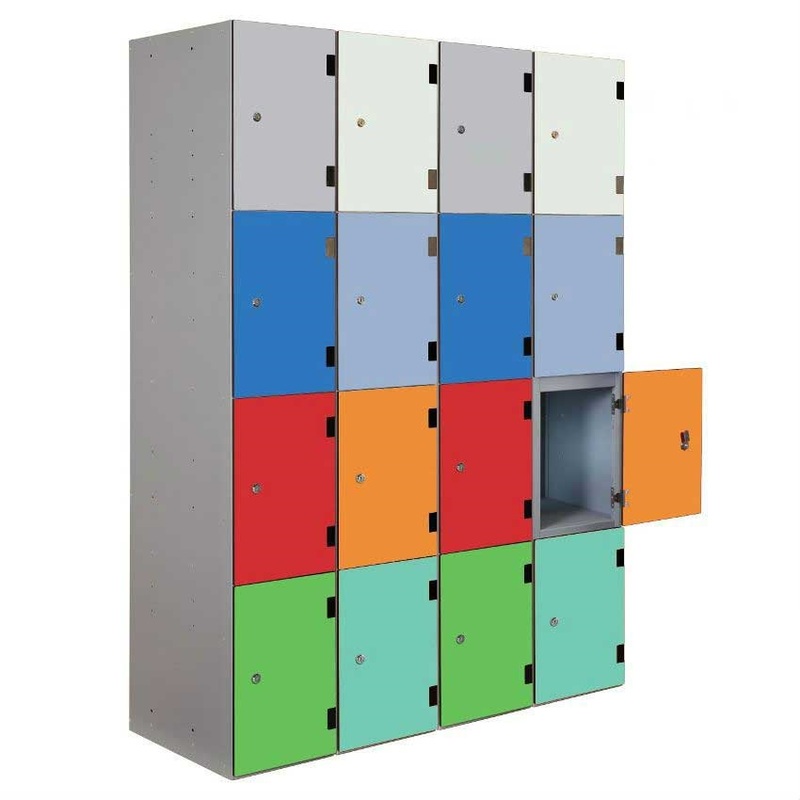 The body of the lockers is pre-drilled to make nesting groups of lockers fast and easy. For convenient storage manufactured in the UK at a very affordable price, nothing beats the Trespa Solid Laminate Door Lockers.